This is the 3rd installation in our 99 Things To Do and See in Sonderborg series. Way before we arrived in Sonderborg I had found Cafe International on Facebook. This is a group of people (most of whom have met each other at Danish courses) who meet up regularly to talk, primarily in Danish, with each other and Danes who wants to join in. Following from afar we could see they had a lot of different events and outing (like the mushroom picking trip we were not in town for). So when I saw the Danfoss tour was just after we had arrived I signed up. On the evening we went in a couple of cars from Sønderborg to the headquarters of Danfoss which is located close to Nordborg on Als. 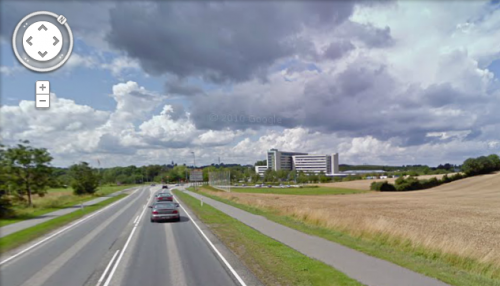 In this area almost everything revolves around Danfoss and the derived businesses and Danfoss campus stretch far. Most of the factories and labs in the campus are low buildings however the main building is a “skyscraper” by Danish standards and stretches 11 floors into the air. This means you can spot it from far away when you approach by road. There were about 25 of us and our tour started out in the foyer that was rebuilt a few years ago. 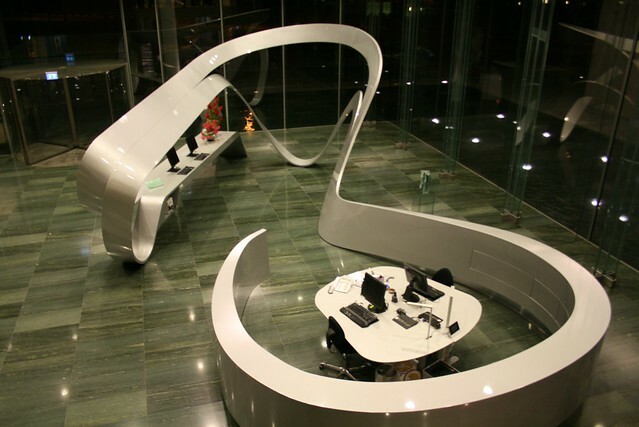 The front desk is custom made and is modeled after a remnant from metal production (Spåne in Danish). Here we got the story of how the company started out in 1933 by Mads Clausen who had a good idea for a compressor valve. Long story short his idea was great and he had more where they came from so by 1950s he had 2,000 employees. 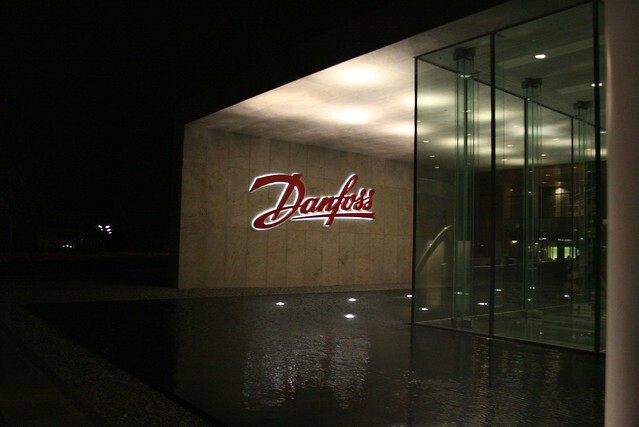 The company expanded globally and today there are about 23,000 people working for Danfoss across the world. Mads Clausen passed away in 1966 and was succeeded by his son Jørgen Mads Clausen. Unlike most companies of this size it is still family-owned which has been significant in how the company has operated. 2011 looks to be a record year for the company which is quite remarkable in the current climate. After the introduction we were taken to the direction floor of the building where we first saw the board room that at one end has a huge backlit cross section of a fossilized forest. 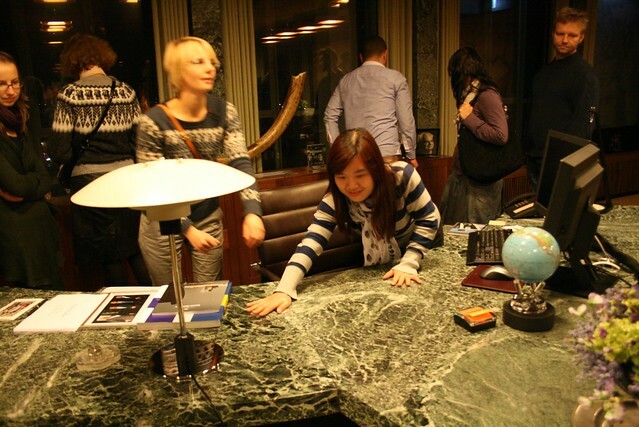 After that we went into the office of the late founder and now his son and chairman of the board. It was quite an experience to be in the office of one of the wealthiest families in Denmark and hear stories of how down to earth they are. When Mads Clausen had the huge marble desk installed he got it fitted with heat to keep the elbows warm – we were invited to try and feel the difference. 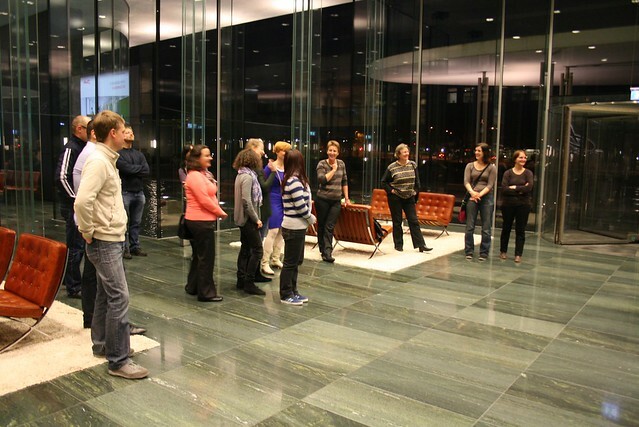 We ended the tour of the headquarters with a trip to the observation deck at the top and a look at the green wall and water features on the ground floor. After that we travelled over to one of the many production facilities and saw parts of the production of the radiator valve that Danfoss is probably most well known for in Denmark. The whole tour lasted about 2 and half hours and it was really interesting to see the company and hear more of the story behind it. Thanks to Meggie and Anne from Cafe International for organising this event. 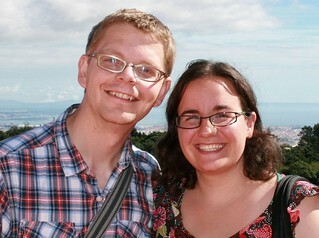 This entry was posted in Things To Do and Sights and tagged company, Danfoss, nordborg, tour by Michael. Bookmark the permalink.